Jesús Laboy, vice president of VIBRA Inc.
Vibra Inc., a reliability services company in the Caribbean and Latin America, will be hosting in September the 11th edition of the “Reliability World Caribbean 2017” conference in Puerto Rico, company officials announced. “Reliability World Caribbean” will be a two-day congress that consists of hands-on workshops and conferences. This year’s theme is the “Industrial Internet of Things,” how this topic applies to maintenance and reliability, and how it will change the way asset health management is carried out. This edition, which will feature a completely renewed format, will be held Sept. 28-29 at the Club Caribe in Cidra. It will provide guidance to various industries in Puerto Rico and the Caribbean to maximize the benefits of their conditional and reliability maintenance initiatives, increasing productivity and minimizing costs, organizers said. 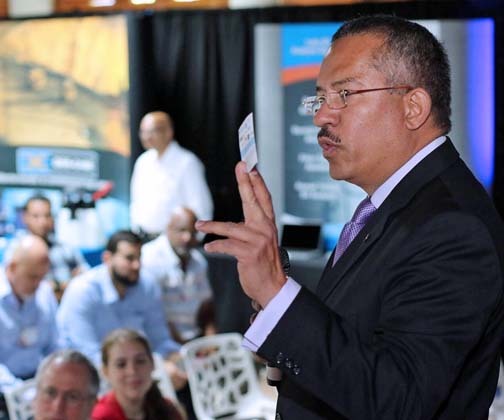 “It is an event aimed at maintenance, automation and manufacturing professionals and engineering professionals looking to provide key tools important for a more reliable, efficient and productive operation,” said Jesús Laboy, vice president of VIBRA Inc., a Puerto Rican company which also has operations in Mexico and the Dominican Republic. “‘Reliability World Caribbean’ is recognized as the most important conference of its kind that provides education in the latest methodology and technologies related to condition-based maintenance and reliability engineering initiatives,” he said. The event will feature a workshop day on Sept. 28 and a conferences and expo day on Sept. 29. The conference also targets engineering professionals, for which VIBRA Inc. has partnered with the Puerto Rico College of Engineers and Surveyors to count the seminars as continuing education for its members. Hey Buddy!, I found this information for you: "PR to host ‘Reliability World Caribbean’ congress". Here is the website link: https://newsismybusiness.com/reliability-caribbean-congress/. Thank you.